Darren Wilson’s no indictment caused the people of Ferguson to erupt: A dispatch from the first night of protests and riots. 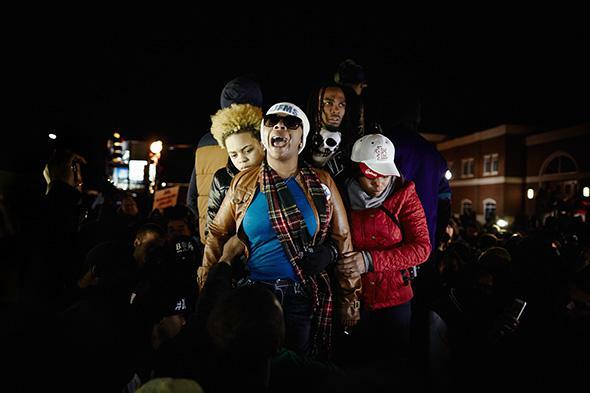 How a quiet vigil turned to a night of rage. 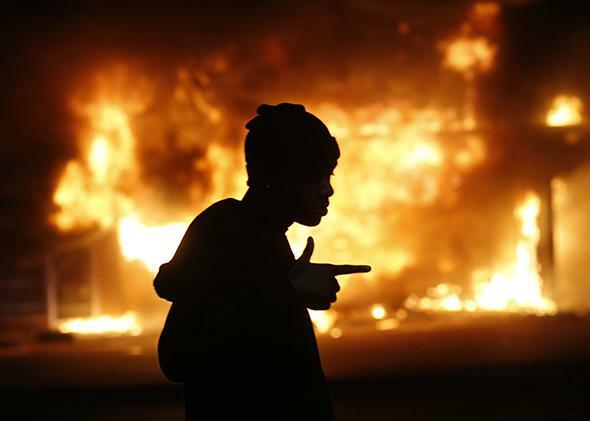 A man walks past a burning building during rioting after a grand jury returned no indictment in the shooting of Michael Brown in Ferguson, Missouri on Nov. 24, 2014. FERGUSON, Missouri—For 108 days, they kept a watchful vigil across from the Ferguson police station on South Florissant Road. Members of the community held signs, led chants, and sat there, policing the police. Early Monday afternoon, only a handful of protesters clustered around the post, a corner of parking lot outside a tire and auto shop. The grand jury’s decision was due at 8 p.m., but at 2, the demonstration consisted of scarcely more than one man with a steel beverage cooler and a drumstick. I sat in the backseat of a Chevy Impala parked a few spaces away from the vigil with three young men I’d just met, listening to new tracks by Migos with the windows rolled down. At around 3, a girl toting a bullhorn entered the nearby Subway sandwich shop. A man named Byron pointed toward the Ferguson Police Department and noted that its cramped accommodations were hardly where he wanted to spend his Thanksgiving. The trickle of arriving protesters turned gradually into a stream, and then the sun set and the helicopters began to swarm overhead. The role-players took their places. Amnesty International representatives huddled in their yellow shirts, next to Legal Observers in neon green caps, while the clergy milled about in bright-orange vestments. Those assigned to scout and secure the perimeter assumed their posts, the percussionists gravitated to the center, and the live streamers wired their devices. By 6, the sidewalk had filled with the rank and file, and a rousing rendition of “We are Family” rang out from the hub. Shortly after 7, they occupied both sides of the street and converged in the middle, shutting off traffic and ushering in the movement’s marquee vehicle, an old white sedan covered in spray-painted messages, with several young demonstrators perched atop it. 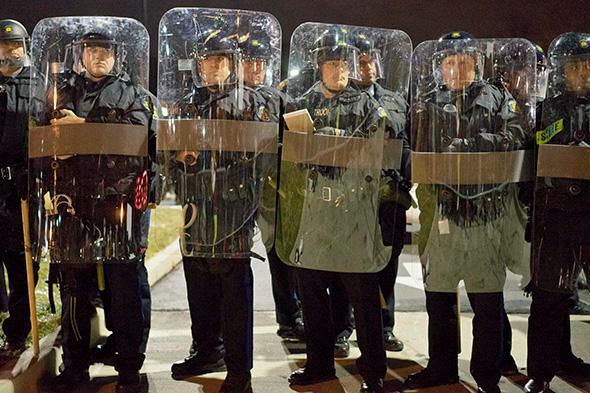 The county police formed a line outside the station, wearing winter layers rather than riot gear. At 7:59, a siren issued from within the crowd and people jumped, only to realize someone had pushed the wrong button on the bullhorn. St. Louis County prosecutor Bob McCulloch then took the podium to soften the blow that everyone seemed to know was coming—they had known for months. As he neared the end of his prefatory remarks, Leslie McSpadden, the mother of Michael Brown, worked her way through the masses and arrived at the car and ascended its bumper to look out over the throngs occupying the street. She wore large sunglasses and a white hat. McCulloch was still talking. “The law also allows all people to use deadly force to defend themselves in certain situations,” he said. Lesley McSpadden, mother of Michael Brown, reacts to the news that the St. Louis County grand jury has decided to not indict Ferguson police officer Darren Wilson. She was sobbing. “Everybody wants me to be calm,” she shouted. “Do you know how them bullets hit my son? What they did to his body when they hit his body?” Murmurs of “no indictment” percolated through the crowd. A fledgling chant of “No justice, no peace” was squashed by a bullhorn. When the decision was announced, nobody packing the five-lane road appeared to register it. I didn’t hear it, and I was up against one of the car’s open windows. When the news did reach the crowd, it seemed to hit everyone like a drop in pressure. McSpadden rocked back and forth in despair. She was comforted by Brown’s stepfather, Louis Head, who jumped onto the car and embraced her. The vanguard of protesters eyed the police battalion through its clear-plastic shields. “Hands up, they still shooting!” they chanted. Another projectile—it must have been a water bottle—came hurtling through the sky, and a girl cried “Stop, this is what they want!” A girl wearing a Fawkes mask chased down and pointed at someone who was going to throw something. If there had ever been a plan, it was by now completely deserted. One contingent continued to run through its repertoire of chants, adding a couple of new ones. “This is what community looks like,” they repeated to the beat of the drum. A group ran into the fray shouting, “Don’t talk to the media.” The rhythm of the chants quickened: “Don’t shoot, don’t shoot, don’t shoot, don’t shoot, don’t shoot.” A chorus of competing bullhorns interjected their separate sermons. The police tightened their line. A group of young girls led a march up the street, but few followed their example. Several gunshots were fired at 8:50—no one could tell their source or target—and then the canisters of tear gas were launched. Protesters furnished their masks and ran headlong toward the toxic clouds. A helicopter’s searchlight swept over the ground. Another projectile soared over the police barricade. A man was brought to his knees and encircled by protesters as he claimed with increasing desperation that he was not the thrower. At 9:05, a phalanx of cars approached the police station and shots rang out. Those congregated in front of the station scattered toward the north, and the police officers took cover behind the squad cars out front. Helicopters buzzed ever louder overhead. Missouri State highway patrol troopers line the threshold between the protesters’ site and the police department. Minutes later, the police began to sweep methodically through the street, announcing their intent to arrest those who didn’t cooperate for unlawful assembly. Someone whizzed by me, saying, “Teargas is coming.” The police truck inched forward and repeated the command over the speaker: “You need to get out of the street immediately or you will be subject to arrest. Do it now.” A handful of lingerers subtly moved toward the outer lanes and paced slowly backward. Then another projectile—this one seemingly larger and launched at a greater distance—it hit a car that had comprised the police force’s ramparts. And more tear gas shot out from the police station southward, glowing red embers with stark white tails. People ran northward from there, grabbing bottles of water to wash out their eyes. I retreated to my car amid a northward stampede, and sought momentary refuge atop South Florissant Road at the crest of a hill overlooking the Little Caesar’s. When it seemed safe to drive downhill toward the center, I passed a flaming trashcan, the first presence I’d seen of fire. I saw a Do It Yourself hardware store that had a shattered window, and Beauty World, whose storefront had also been reduced to broken glass. Toppled mannequin heads had rolled into the middle of the street. Further down, someone breathlessly recounted his run from a teargas offensive that had caught a woman who had just suffered a heart attack and was being brought back to the tents for medical attention. Driven northward by the advancing police line, a band of protesters linked hands and strode five abreast in compliance, but someone had detected the coming onslaught of tear gas. “Here it comes,” she said, and the chain was broken in the ensuing scramble. The flares arched overhead and landed back in the parking lot, where a young mask-wearing man gripped one and threw it back at the police. A massive yellow dog that I recognized as a protester’s canine then came bounding past us, to the north and out of danger, dragging its leash behind. 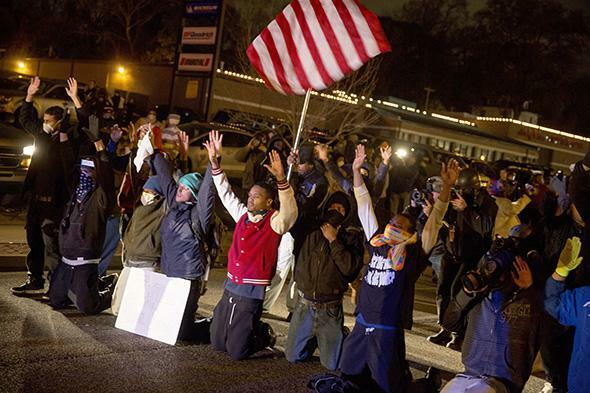 Protesters kneel with their hands up during a demonstration. The eyes of a mass of people are always at the edges. From the interior, you can’t see what you’re up against, only what insulates you. Wherever the front is, the people there send signals to the assembled ranks, and it travels like a wave through a rope. But each time the tide of tear gas drove the protesters away, an undertow brought them back into the fold. I ultimately did give in and went back to my car and headed up the hill out of town. Driving up South Florissant, I saw a band of kids, some fully masked, some wearing bandanas, come toward me. One lanky kid in a bandana stood in front of my car, so I stopped and he advanced a couple steps then got to the sidewalk, where the others had gathered outside Corner Coffee House. One of them hoisted a metal chair and pitched it through the window before they headed down the hill. I found myself outside the same Little Caesar’s, except now it was up in flames. I asked the GPS for directions, and it responded, “Directions not available—a route is currently not available due to road closures.” I made my way to the interstate. There was hardly any traffic beside a police cruiser, lights flashing, headed the other way.